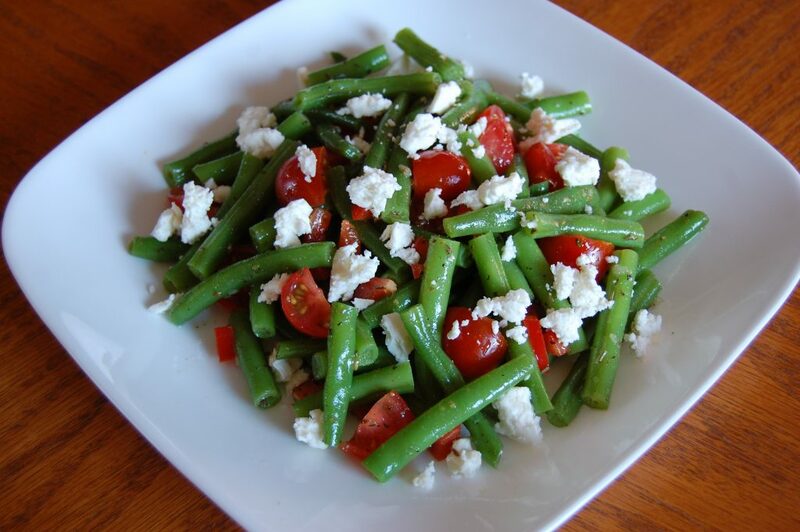 Fresh green beans, red bell pepper and tomatoes, tossed in a tangy Greek vinaigrette, topped with creamy feta cheese! In a small bowl, whisk together olive oil, vinegar, garlic, parsley, oregano, Dijon mustard, salt, and pepper; set aside to allow flavors to marry. Trim ends off green beans and cut in half. Fill a medium pot with salted water; bring to a boil over medium-high heat. Fill a a medium bowl with ice water; set aside. Once water is boiling, add green beans and cook for 4-5 minutes or until tender-crisp. Drain and immediately submerge beans into an ice bath to halt the cooking process. 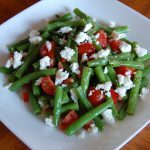 In a medium bowl, combine green beans with red pepper and tomatoes; toss with dressing to coat. Divide salad among 4 plates or bowls. Garnish each plate with crumbled feta.